While the Matterhorn is not the tallest mountain in the Alps, it's certainly the most well known. In part that's due to its distinctive pyramidal shape, which creates high visual prominence and also makes for an extremely difficult climb. The first face wasn't tackled til 1865 and ended in the deaths of four climbers, and the fourth face wasn't scaled until 1962. Contributor Paride Musci used a DJI Mavic Pro 2 to create this magnificent video of the majestic Swiss mountain. 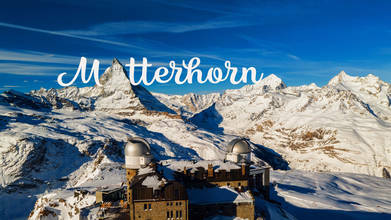 Description: Matterhorn (4478m) seen from Zermatt 1608m, Gornergrat 3135m and Klein Matterhorn 3883m in winter time.